Most of you know that many culinary spices can also be healing. So I looked up the spices that I am currently using in my Ayurvedic dishes and I am posting some of their healing properties to show you that my motto, The Good Taste of Health, is in sync with these spices. 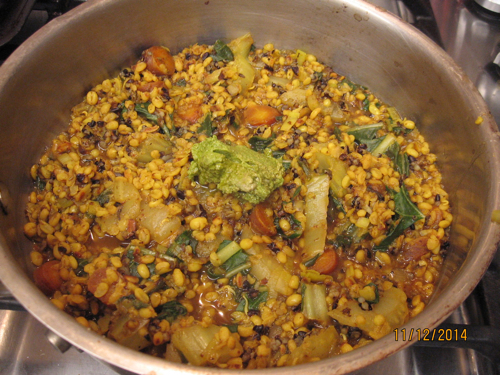 The spices that are in my curry mix for many of my dishes are: cumin seeds, coriander seeds, fennel seeds, garlic and ginger, mustard seeds, and turmeric powder, used in my kitchari recipe (link to recipe at the end). Kitchari simmering on my stove. Hers are some interesting culinary/medicinal facts about these herbs & spices. Note, this is not a complete list of the benefits of these herbs. 1. Cumin – In the Ayurvedic Cookbook by Amadea Morningstar with Urmali Desai, the author notes that keeping these seeds too long will lessen their culinary & medicinal power, so use before one year. Cumin can be used to dispel toxins and tone the digestive tract. Whilst actions warming, when used with coriander and fennel seeds (also only list) it can relieve digestive distress. 2. Coriander – In Eat-Taste-Heal by Yarema, Rhoda, & Brannigan coriander is listed as an aid to improve digestion, offset spicy foods, relieve gad and promote urination. 5. Ginger – According to Healing with the Herbs of Life by Leslie Tierra, ginger has many multi-healing applications such as easing motion sickness; acts as a detoxifier; alleviates digestive upset, nausea, gas, poor digestion, burping, and excessive mucus; treats cold, flu and lung congestion; warms the body; relieves muscles pain when applied to skin and (sore) throat as a foment (bathe with warm water or medicated lotions); and can be used as a tea, a bath or a foot soak. Let’s not forget its culinary role, as in gingerbread, ginger snaps (my favorite cookie!) and in pumpkin pie. 7. Turmeric Powder – Considered by Ayurveda to be good for all three dosas (body types: Vata, Pitta, Kapha). Medicinally, according to The Ayurvedic Cookbook, an excellent blood purifier with anti-inflammatory properties. It stimulates complete protein digestion of proteins and prevents creation of toxins. Also, turmeric is healing to she liver. Unlike the other Spices, the golden color adds color to whatever dish you are making. What I have done is to take each of the seeds and mixed them a shaker , so when I make a dish such as chitchat, I put a small amount of oil or ghee in trepan, add the seeds, garlic, ginger and turmeric and then add other ingredients. 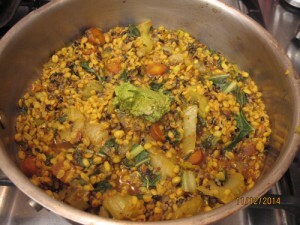 The yellow split mung beans and grain I use turn a golden yellow and adding the veggies makes a complete meal, since the beans are a good source of protein. This entry was posted on Friday, February 20th, 2015 at 4:36 pm	and is filed under Kitchen Nutrition. You can follow any responses to this entry through the RSS 2.0 feed. You can skip to the end and leave a response. Pinging is currently not allowed.